Since 2001, our Senior Companion Program has provided companionship, transportation, and support to isolated, homebound elders and their families. The goals of the Senior Companion Program are to keep elders out of institutionalized care for as long as possible, and to promote their quality of life. Recently, our focus has expanded to providing respite care, education, and support for caregivers that allows them to continue caring for elder relatives in their homes. 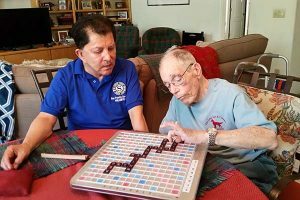 Bob Lopez, an Our Family Services’ Senior Companion in Tucson, has been serving Saul, an 81-year-old man with Parkinson’s disease for about a year. Parkinson’s has left Saul weak, and he has trouble walking. It also creates a speech impediment that makes it difficult for people to understand Saul. Bob and Saul spent many months together talking and exercising, and the efforts made Saul strong—both physically and relationally. A few weeks ago, Saul’s tremors caused him to fall and sustain significant physical injury. Saul received medical treatment and was temporarily admitted to a residential rehabilitation facility. Bob visited Saul in rehab and advocated for him as one of the only people who could understand Saul’s speech. In addition, Bob encouraged Saul with his physical therapy and kept him motivated to return home to his beloved wife. Saul is home again, and Bob is a source of respite and hope for Saul’s wife who serves as Saul’s primary caregiver. Saul and his wife don’t know how they would manage without Bob’s faithful service. Bob’s respect, compassionate listening ear, and support have made all the difference in preserving Saul’s strength and his wife’s hope. Senior Companion services are provided by a corps of 44 trained volunteers, who are themselves over age 55 and low-income, and who receive a small, tax-free stipend. We partner with local organizations, including the Pima Council on Aging and other social service agencies to match each Senior Companion volunteer to their elder clients. Senior Companions receive 40 hours of training before providing service, and additional training throughout the year at monthly in-service meetings. Senior Companions are knowledgeable volunteers who build strong one-on-one relationships with elders and their caregivers, becoming valued supporters and resources. Our Senior Companion volunteers, and the clients they serve, represent diverse populations including those from the Tohono O’odham Nation, the Pascua Yaqui Nation, and monolingual Spanish speakers. Our Family Services is looking for big-hearted elders to serve as Senior Companions. Do you have the time and desire to make a difference in the community? Perhaps the Senior Companion Program is right for you! To learn more, and to apply, contact the program office at (520)323-1708, ext. 248. Elders need you!